As you can imagine, cooking is something that gets me excited, and it is something that I often look forward to — particularly when I get to cook for others. But recently, I got to experience the same sensation from a different perspective. I was recently starting my prep for a dinner party and as always, there was a lot to do. I became a little careless, and sliced … it was a serious cut on the top of my finger. It turned out to be fine — in case anyone was worried — but cooking no longer became an option. So in jumped my fearless wife. While she was happy to help, her cooking ability leaves quite a bit to be desired. 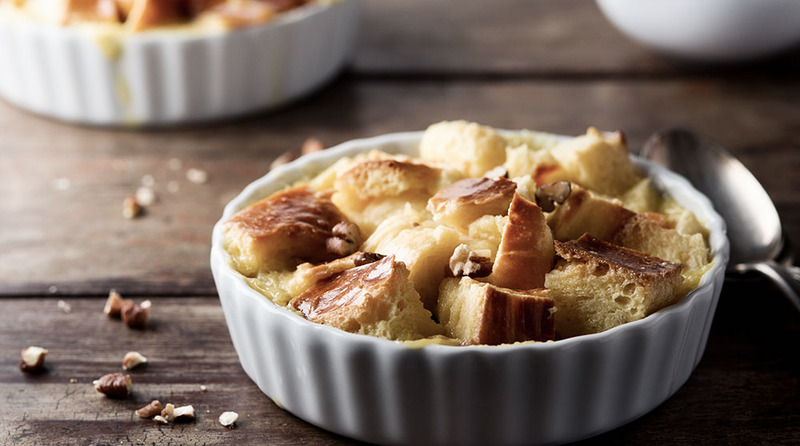 We had an hour and half before guests were arriving and still so much to do – including making the vanilla bread pudding. She knew the menu, as she often decides what we make, but not how to actually make it. For the first time in my own kitchen, I had to take a back seat and let someone else do the cooking. I walked her through the steps of making each item. I tried along the way and stirred where I could. I watched her carefully and timidly bringing her menu to life. She did fantastic. I think she even surprised herself with how well she did. I definitely learned how hard it is to explain how to execute a dish. For example, not everyone can simply tell when something is done and not everyone, even my wife who has watched me cook for years, tastes their food to make sure it is seasoned properly (helpful tip: season lightly, taste and season more if necessary). The most important lesson I learned, though, is that everyone can cook a great meal with the proper directions and guidance. Watching someone cook a great meal or even a dish that they would normally never try was a great feeling. Seeing the pride my wife had with the meal she had made was also pretty neat. With proper direction, I think everyone can cook great food, and I hope that I can continue helping people make memorable meals. Combine half-and-half, milk, eggs, 1 cup of the sugar, salt, cinnamon and nutmeg in a large mixing bowl. Beat all ingredients together until mixture is smooth (2 to 3 minutes). Scrape vanilla seeds into the bowl and stir in. Over medium heat, toast walnuts in a pan until golden brown. Combine bread and nuts into the egg mixture. Coat all pieces of the bread. Add vanilla bean to mixture for extra flavour (remove before cooking). Let the mixture stand for 1 hour, stirring occasionally to ensure egg mixture is absorbed by the bread. Grease a high-sided ovenproof pan (9” x 9”) with butter. Place mixture in pan, spreading out evenly, but not packing it down. Sprinkle remaining sugar over top. Place in oven for 50 minutes. Remove and let stand for 10 minutes. Match: Serve with a glass of late harvest or a soft, peaty scotch.